It was an afternoon of learning for ASP Cebu parents, teachers and therapists, as our ASP Chairman Emeritus, Ms. Dang Koe engaged the participants in a seminar on a learning approach developed by Prof. Eric Schopler known as the Treatment and Education of Autistic children and related Communication handicapped Children (TEACCH) Method, entitled “Autism-Friendly Teaching Environment: Structured Teaching at Home and in School“. 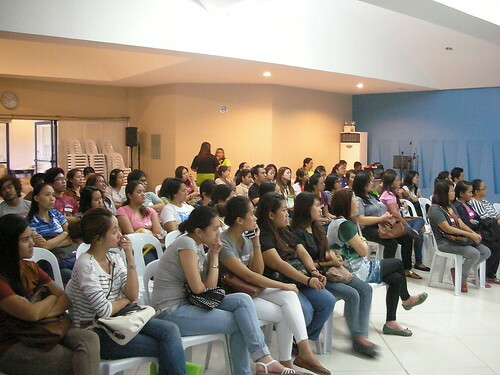 The event was held last 6 September 2014 in Cebu City, with 75 attendees present. As one of the participants commented, “The flow of the seminar was very spontaneous since it was a parent who spoke from real experiences. We felt the journey she went through and even cried along with Ms. Dang”. The audience realized that persons with autism often have difficulty in handling changes in the environment, receptive and expressive language and sequential memory thus the TEACCH Method provided the individual with structure and organization. The method relied on four (4) basic principles which was explicitly discussed by our sought out speaker namely: physical structure, daily scheduling, individual work system, task organization. About the Contributor. Sandra Espina served as the ASP Cebu Chapter President from 2009 to 2014 and is currently the chapter's adviser. She is the Managing Director of Ivory Properties. Sandra and her spouse Joseph, Rotary District 3860 Governor, are parents to three boys. Zach, their youngest, is on the spectrum.